Since 2009 we have been contributing to the development of Europeana, the European platform that provides access to the digitised collections of cultural heritage institutions (CHIs) across Europe. One of our main contributions to Europeana is the Europeana Licensing Framework which ensures that data published on Europeana can be freely reused, and that all digital objects available via Europeana come with easy-to-understand information about their copyright status and under which conditions they can be reused. Institutions making their collections available via Europeana provide this information by labelling each digital object with one of fourteen different rights statements++Fourteen statementsSee the list of available rights statements on Europeana.eu for an overview.
. The list of rights statements includes Creative Commons (CC) licenses (that allow anyone to reuse a work under certain conditions), a Public Domain Mark (PDM – for digital objects that are in the public domain and can be used without any restrictions), and a number of other statements that apply when a work is still in copyright and can be accessed but is not offered for reuse. Since 2015 one hundred percent of the more than fifty million objects in Europeana have a valid rights statement. Since 2015 one hundred percent of the more than fifty million objects in Europeana have a valid rights statement. Given that determining the copyright status of a large number of works is complicated, it is no surprise that not all of the right statements are accurate. Over the years we repeatedly run into rights statements that were clearly inaccurate. This can be a problem because people who want to reuse objects available via Europeana need to be able to rely on those rights statements. In order to understand the magnitude of the problem we have set out research on the accuracy of the rights statements in Europeana. Today we are are publishing the results of this research as a paper (PDF). 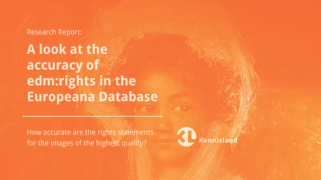 We have constructed a methodology in which we individually assessed the accuracy of the rights statements++Rights statementsKennisland has been working with Europeana since 2009 to make cultural heritage available for reuse. Read here more. of a representative sample of the digital objects made available via Europeana. The results from the sample give an indication of the accuracy of the rights statements of the entire database of Europeana. 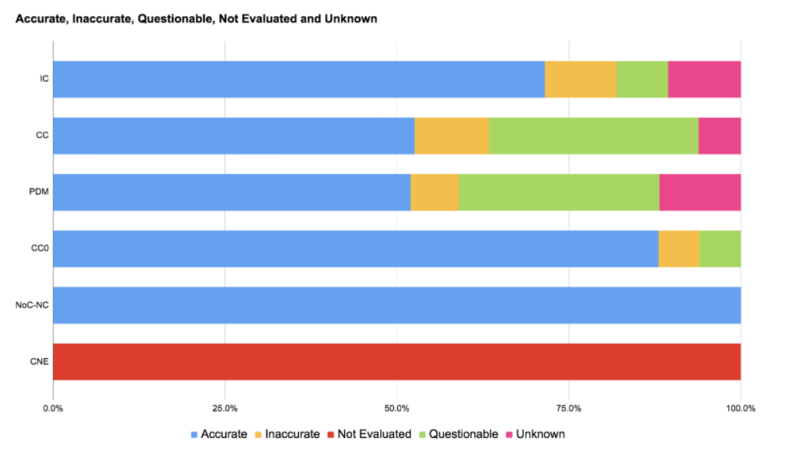 The results show that at least 61.8% of the rights statements were accurately applied and that at least 9.1% were inaccurate based on the available information. 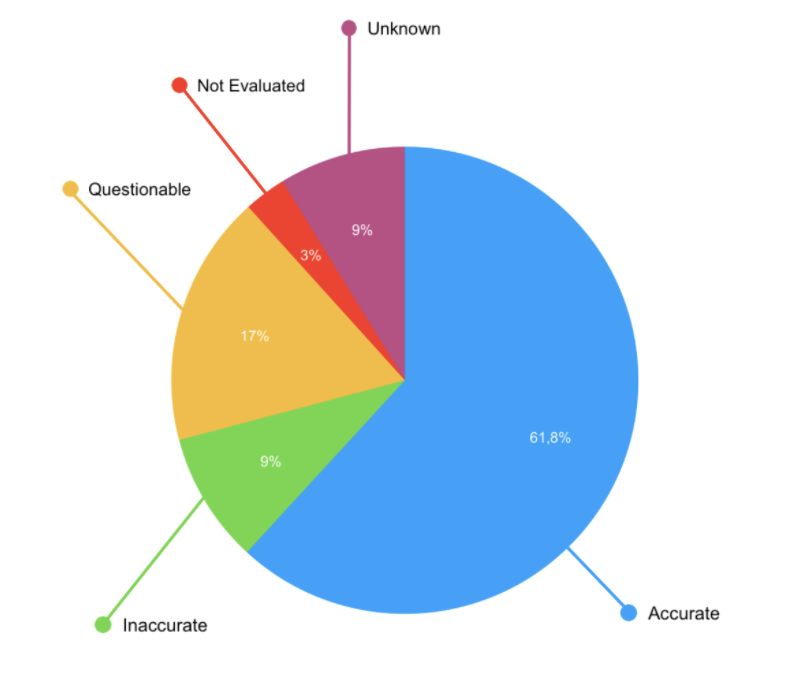 The accuracy of 17.4% of the rights statements is questionable, while for 8.8% it was not possible to determine the accuracy. When youThe results show that at least 61.8% of the rights statements were accurately applied and that at least 9.1% were inaccurate based on the available information. look at the accuracy of the rights statements, two categories stand out because their accuracy is significantly lower in comparison to the other categories. The accuracy of the Creative Commons and Public Domain rights statements are close to (at least) 50%. In case of the Creative Commons statements this had to do with the lack of information to determine whether consent was given by the rights holder. The Public Domain statements were questionable due to possibly inaccurately applied national laws concerning digitisation++Differences in national leglisationHere you can find more about the differences in national legislation on digitisation. and because some of the objects with a PDM statement were possibly still in copyright. The copyright term was often inaccurately applied. In copyright rights statements were applied to ‘objects’ that were not creative works, for instance ‘objects’ that only displayed facts or metadata. Creative Commons licenses were inaccurately applied or likely to be inaccurate due to a lack of consent from the actual rights holders. The inaccurately applied CC licenses create an unwanted effect. CC licenses should be used by rights holders of works that are in copyright to allow people to share, use, and build upon a work. They are intended to give copyright holders the option to communicate what people can and cannot do under certain conditions. However, the research on the Europeana database shows that CC licenses are possibly used with the opposite effect: to set conditions on the use of a work that is already freely available. Eventually the wrongful application of Creative Commons licenses leads to copyfraud++CopyfraudCopyfraud refers to false copyright claims with respect to content that is in the public domain. which limits reuse and harm the underlying ideas behind the purpose of the Creative Commons licenses. Our research paper concludes with a number of recommendations addressed to Europeana. 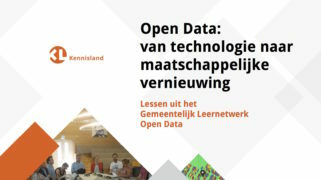 Europeana can undertake activities to improve the quality of the rights statements through its policy documents and training materials, but cannot by itself solve the underlying problems concerning the inaccuracy of the rights statements. Europeana can undertake activities to improve the quality of the rights statements through its policy documents and training materials, but cannot by itself solve the underlying problems concerning the inaccuracy of the rights statements. The accuracy is in first instance the responsibility of the institutions that make digital objects available via Europeana (data providers). We have set forth a number of recommendations for Europeana to improve the accuracy of the rights statements, which are intended to open up a dialogue with these data providers about how to improve the accuracy. conduct further research on the application of Creative Commons statements and the issues posed by non-digital objects. The results of our research may point to problems that are not limited to collections made available via Europeana. Over the past years that Creative Commons Licenses and other legal tools have been taken up by large numbers of cultural heritage institutions across the world. They are widely used to provide information about the copyright and reuse status of works that libraries, archives and musuems publish online. It is possible that cultural heritage institutions which do not work with Europeana are also struggling with correctly applying Creative Commons licenses. One factor that is likely to contribute to this is the fact that CC licenses have not been designed with CHIs in mind. While CC licenses have been designed to allow creators and other rightsholders to make their own works (in which they own the rights) available for reuse, CHIs generally do not own the rights of the works in their collections. Given this, CHIs should benefit from guidelines for the use of Creative Commons licenses that take this fact into account. From our perspective developing and promoting such guidelines should be done by Creative Commons, and we are looking forward to discussing the outcomes of our research with the Creative Commons community at the upcoming Creative Commons Global Summit. Do you have questions, comments or feedback? Contact Judith Blijden by sending an email to jb@kl.nl.